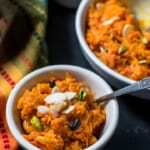 Gajar halwa or Carrot pudding is a delectable dessert made from grated carrots, milk, and sugar. Learn this (almost) hands-free approach to making one of India’s most beloved desserts using an Instant Pot. 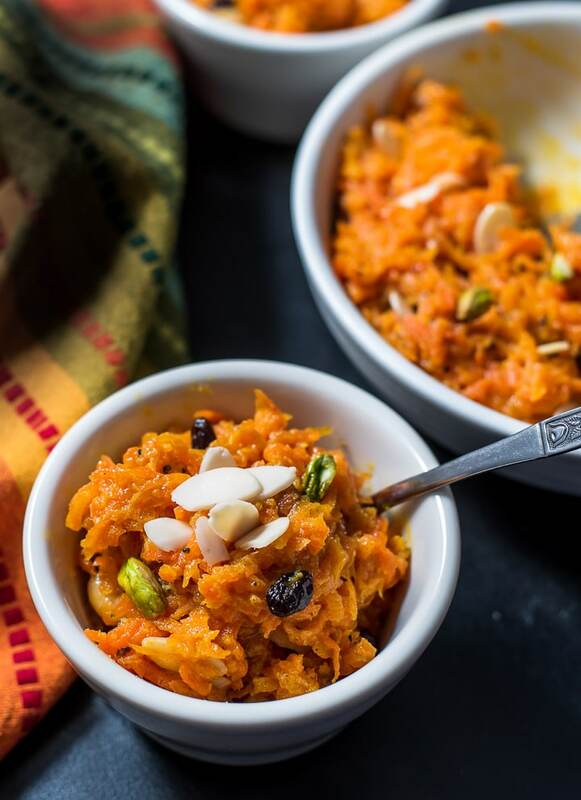 For those who don’t own an Instant Pot, don’t be disappointed, I have also included a 30-minute recipe to make Carrot halwa on your stovetop. 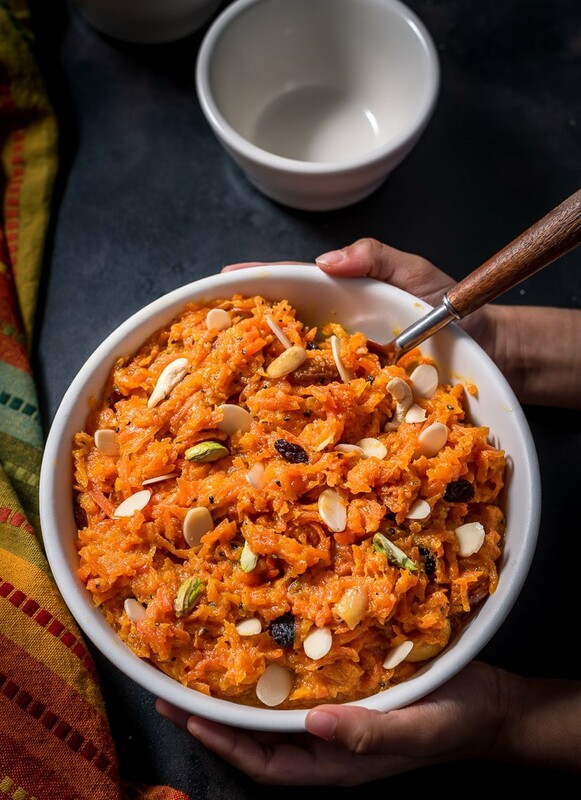 What is gajar ka halwa or carrot pudding? 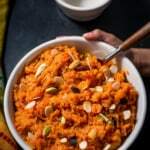 Gajar halwa also known as gajrela or gajorer halwa, is made by cooking grated carrots along with ghee, milk, sugar, nuts and in some cases khoya (milk thickened by heating it on a slow flame till almost all the moisture gets evaporated). Sometimes condensed milk is also added for a rich, creamy texture. 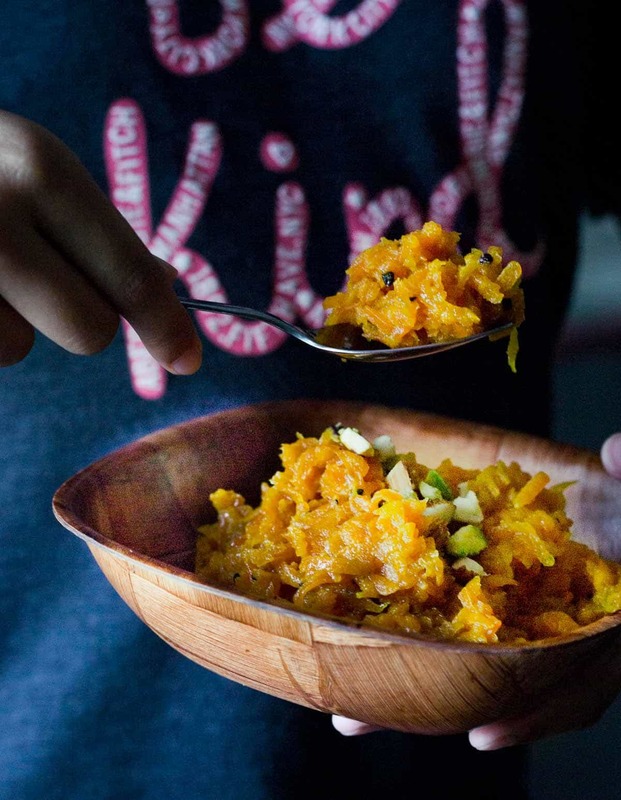 In India, gajar halwa is savored during winter months and during festivals such as Diwali, Eid, and Holi. Most folks from the US who eat at Indian restaurants would have seen this dessert labeled as carrot pudding. How to make carrot halwa? Gone are the days when making Gajar Halwa or Carrot Halwa took hours. Yes, it took at least two hours, from what I remember. Making carrot halwa was a project that my mom would undertake every Saturday when she had her day off. She strongly believed that eating carrots would help my brother’s eyesight (he got his glasses when he was 9). I am not sure about his eyesight, but my stomach was super thankful. 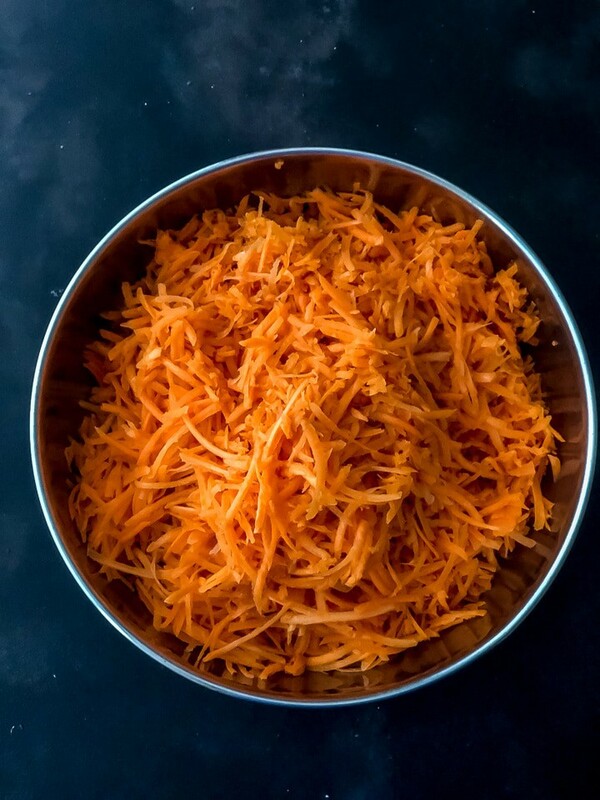 The process of making carrot halwa involved peeling carrots and then grating them using a hand-held grater one by one. If that still sounds okay, imagine doing it for almost 4 pounds of carrots. After the grating was done, my mom would take out a huge kadhai (wok) to start the cooking process. 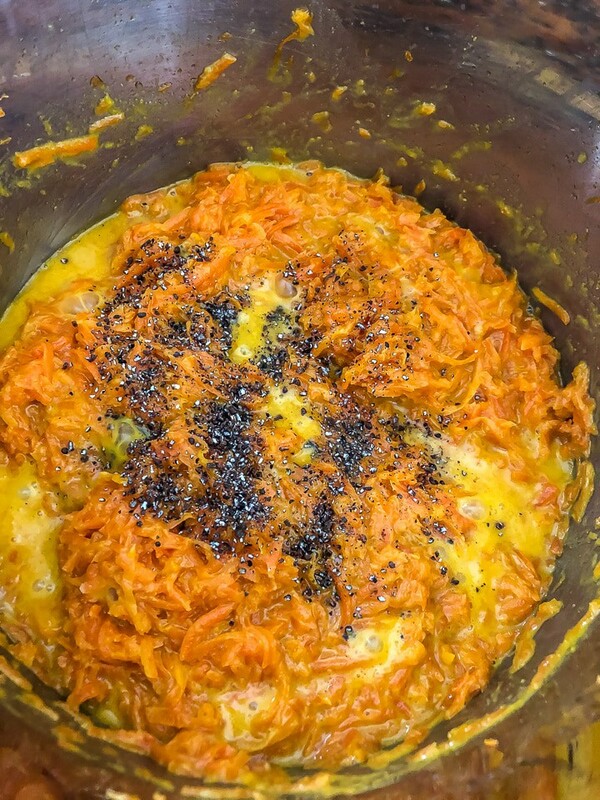 Since she didn’t use condensed milk or khoya, the recipe called for a copious amount of milk, which when reduced gave the dish the rich, creamy texture that a perfect carrot halwa calls for. Reducing the milk took an hour and involved quite a bit of stirring too to make sure the carrot halwa mixture didn’t stick to the bottom of the pan. 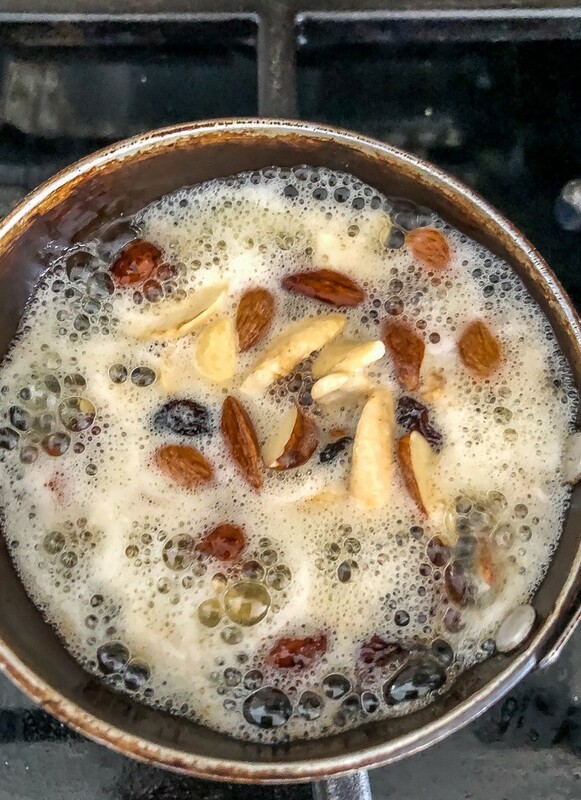 Once the milk thickened, ground cardamom powder was added to the dish along with a medley of nuts tempered in ghee to enhance the flavor. Yes, and all that took two hours. So, how do you make gajar ka halwa in 30 minutes? 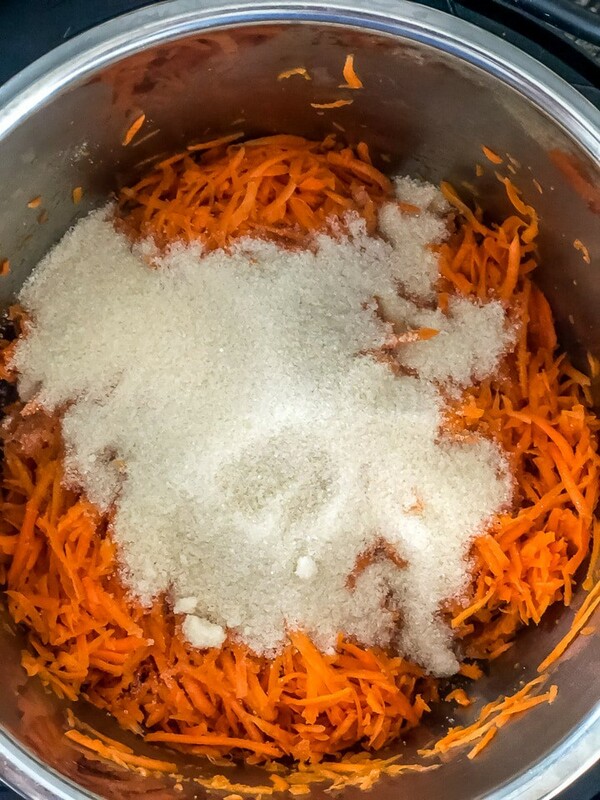 If I had to explain in two sentences this is how I would describe the process – Grab a packet of peeled carrots and a trusty food processor, to reduce the prep time to 5 minutes. Substitute some portion of the milk with condensed milk and voila, you don’t have to toil in front of the stove for an hour. YAY! How to make Gajar ka halwa? Over stovetop – takes about 30 minutes. Instant Pot – saute function – The saute function would be equivalent to making it over a stovetop. The only benefit of using an Instant Pot would be to reduce the splatter. This also takes about 30 minutes. Instant Pot – slow cook function – About 2 hours. 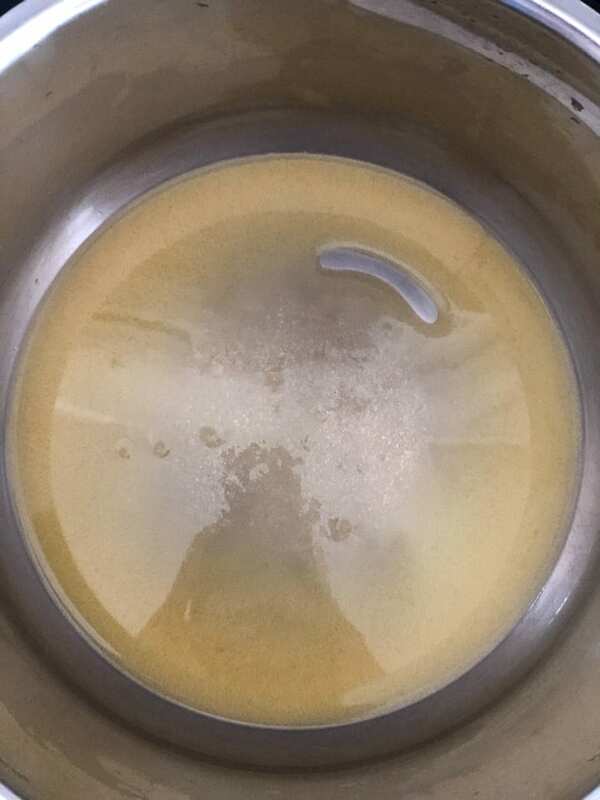 Instant Pot (or any other pressure cooker – Pressure cook function – Takes about 5 minutes followed by quickly releasing the pressure. As you may have noticed, I do not prefer making carrot halwa using a pressure cooker. This is because it not only impacts the color but also turns this delicious treat into a mush. That’s just my personal opinion and enough and more people make carrot halwa using the pressure cook function. Add grated carrots and sauté them for 8-10 minutes. Add milk and condensed milk and mix well; continue to cook till the milk gets absorbed and the mixture has thickened (takes around 15-20 minutes). Heat 2 tablespoons ghee in a pan and fry the cashew nuts, almonds, and raisins until golden. Add the roasted nuts to the carrot halwa mixture; mix well and serve warm. Sauteing the grated carrots in ghee for 6-8 minutes over high heat. Add milk, sugar and powdered cardamom seeds. Mix well and slow cook on medium heat for 2 hours. Saute again for 4-5 minutes till carrot halwa mixture has thickened like in the picture below. 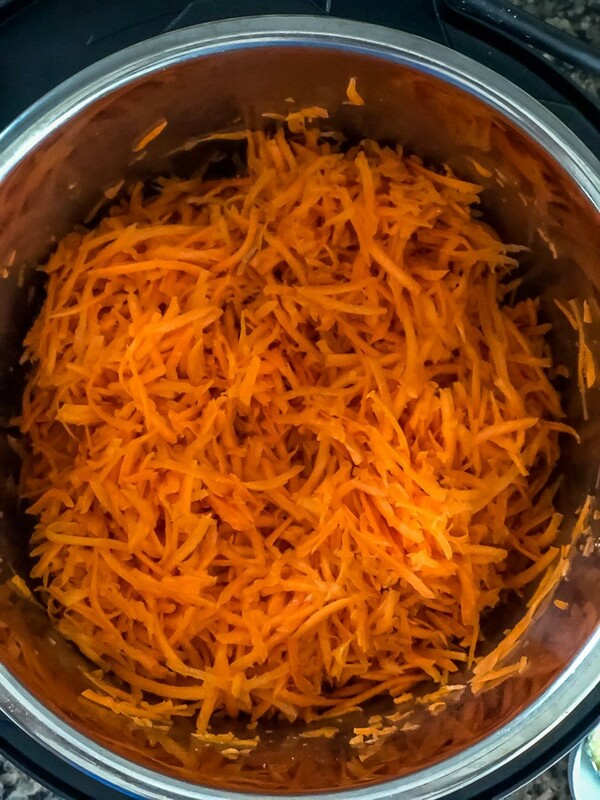 Grate the carrots by hand or using the shredding disc on your food processor. Don’t grind the carrots in a blender. Don’t pressure cook the halwa. Either slow cook or saute it as mentioned above. [Time-saving tip] – use baby carrots (if available), they not only taste delicious, you’ll also don’t have to peel or wash them. Khoya – Replace both milk and condensed milk with about 2 cups of khoya. Add the khoya after the carrots have been stir-fried. Skip the condensed milk and replace it with 1/2 cup milk. Do you really need an Instant Pot? Instant Pot Buying Guide- Which Instant Pot is right for you? Duo versus Duo Plus - Learn the difference? 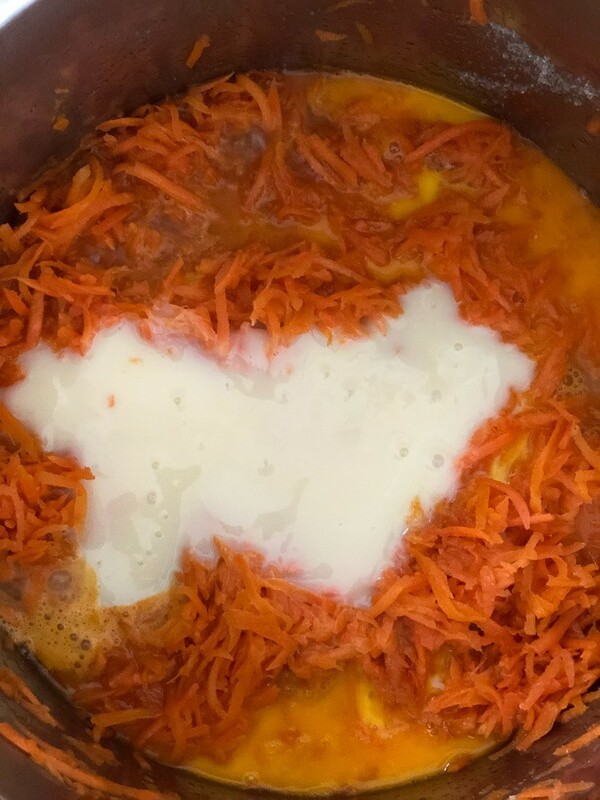 I would love to hear your experience making carrot halwa. Please do drop a line and let me know. Before you leave, do follow me on Pinterest and pin this recipe to your board to make it in the future. Looking for easy recipe ideas? Subscribe to our newsletter to get new recipes and time-saving tips delivered straight to your inbox! 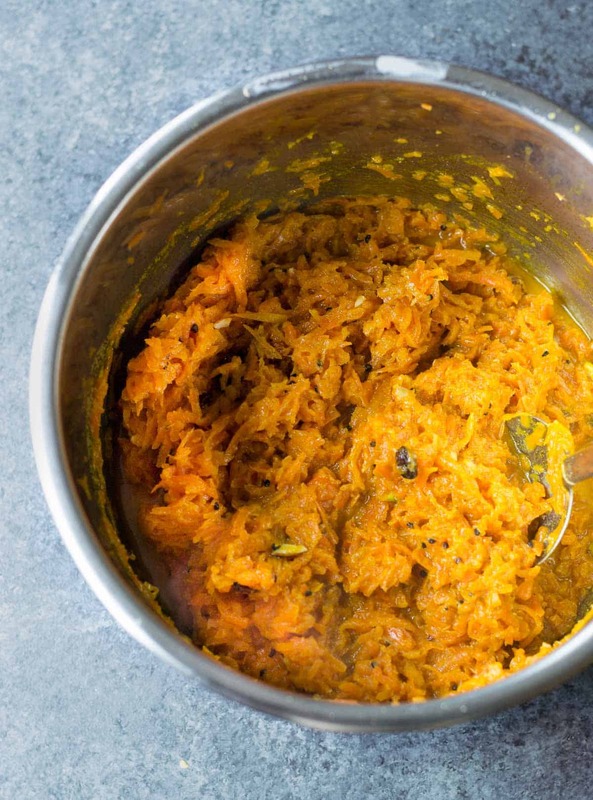 Make this mouth-watering Gajar Halwa or Carrot Halwa in around 30 minutes. No more toiling in the kitchen for hours! Add ghee to a deep dish kadhai (or wok) and heat it over medium heat. Add grated carrots and sauté them for 8-10 minutes. Add milk and condensed milk and mix well; Continue to cook while stirring occasionally till the milk gets absorbed and the mixture has thickened (takes around 15-20 minutes). Add the roasted nuts along with cardamom powder to the carrot halwa mixture; mix well and serve warm. Add ghee in the steel insert of the Instant Pot and press the Saute function. Press the Adjust button to move the selection to “Normal” and wait till the display reads “Hot.” Add grated carrots and sauté them for 8-10 minutes. Add milk and condensed milk and mix well; Cover and choose the slow cook option. Set it in the “Normal” mode. Adjust the time to 2 hours. Make sure the vent is always at Venting before you begin slow cooking. As the cooking cycle comes to an end, heat 2 tablespoons ghee in a pan and fry the cashew nuts, almonds, and raisins until golden. Once the cooking is done, open the Instant pot and press the Saute function. Press the Adjust button to move the selection to “Normal”. Saute again for 4-5 minutes till carrot halwa mixture has thickened as desired. Add the roasted nuts and cardamom powder to the carrot halwa mixture; mix well and serve hot. Add ghee to the steel insert of the Instant Pot and press the Saute function. Press the Adjust button to move the selection to "low" and wait till the display reads "Hot." Add grated carrots and sauté them for 8-10 minutes. Add sugar and mix well. 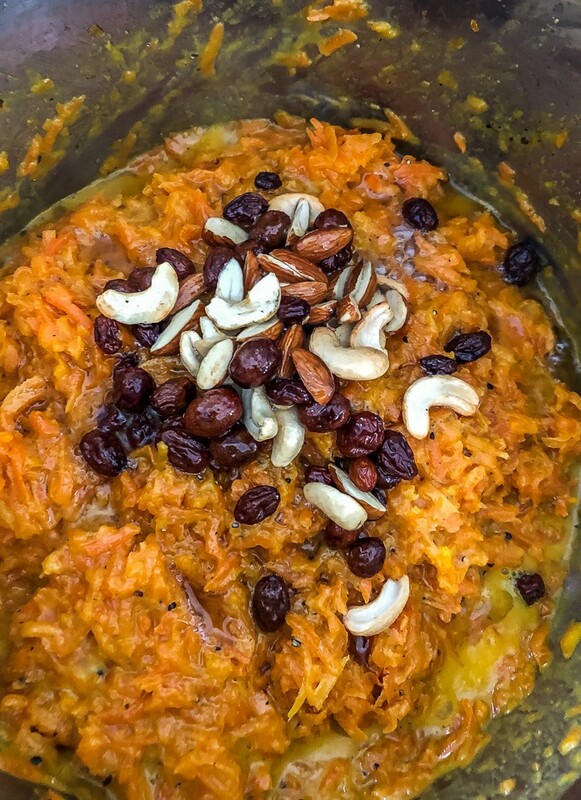 Add the roasted nuts and cardamom powder to the carrot halwa mixture; mix well and serve warm. 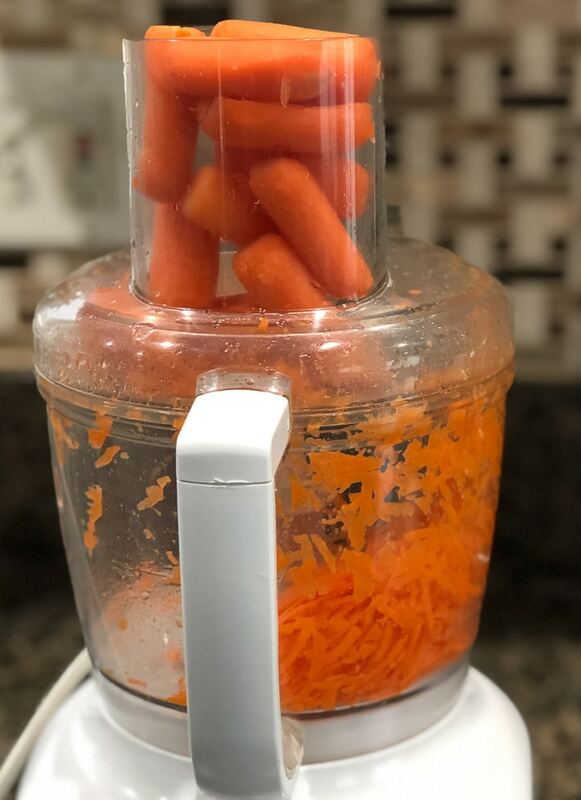 Grate the carrots by hand or using the grating blade on your food processor. Don't grind the carrots in a blender. Don't pressure cook the halwa. Either slow cook or saute it as mentioned above. [Time-saving tip] - use baby carrots (if available), they not only taste delicious, you'll also don't have to peel or wash them. If you do not want to use condensed milk, you can substitute with 1/2 cup of milk. Also, using condensed milk makes it creamier. If not using condensed milk you may need to increase the amount of sugar by a tablespoon (or as per taste). Khoya - Replace both milk and condensed milk with about 2 cups of store-bought khoya. Add the khoya after the carrots have been stir-fried. Khoya is evaporated milk made my cooking/stirring milk till all the liquid has evaporated and milk solids are left behind. Hi ,Thanks you for the recipe . can i use khoya/mava instead of condensed milk ? if yes then how much for the recipe given? If you are using Khoya instead of condensed milk, it is typically added after the carrots are cooked. Always add Khoya before sugar so that you can adjust the sugar depending on the sweetness of your khoya. For this recipe, a cup of khoya should be sufficient. Once you add Khoya, cook for 5 more minutes and turn off heat. Hope this helps.